Released 15 years ago, Ang Lee's Crouching Tiger, Hidden Dragon obliterated—and to this day still holds—the record for highest-grossing foreign-language film in American history, making over $128 million. With a $17 million budget, Lee directed Chow Yun-Fat, Michelle Yeoh, Zhang Ziyi, and Chang Chen in the martial arts-action-love story, based on the fourth book in an epic wuxia romance series written by Wang Dulu from 1938 to 1942. Lee’s attempt at marrying Chinese operatic melodrama and martial arts adventure was a successful one, with the film winning four Academy Awards, including Best Foreign Language Film. On the anniversary of the film's release, and with a sequel coming next year, here are 15 things you might not know about Crouching Tiger, Hidden Dragon. 1. JET LI WAS INITIALLY ON BOARD. 2. SHU QI WAS TOO LAZY TO PLAY JEN. She was Lee’s original choice. Unfortunately for Lee, Shu Qi didn’t want to deal with the long shooting schedule and months of getting into shape and martial arts training. She referred to herself as “lazy” when talking about turning the role down. 3. IT WAS ZHANG ZIYI’S SECOND FILM. The then 19-year-old Ziyi got her opportunity when Qi passed on Jen, and Lee found her to have “cinematic charisma.” Lee chose her before seeing her previous movie, Zhang Yimou's The Road Home, and was glad after he noticed she looked nervous in that performance. 4. LEE PITCHED THE MOVIE TO MICHELLE YEOH AS SENSE AND SENSIBILITY WITH MARTIAL ARTS. Lee directed the 1995 movie adaptation of Jane Austen’s classic novel starring Emma Thompson, Kate Winslet, and Hugh Grant. 5. YEOH DREW FROM ANG LEE’S WIFE FOR HER CHARACTER. The actress modeled her character, Yu Shu Lien, after Jane Lin, a microbiologist who has been married to Lee since 1983. 6. THE TITLE IS A QUOTE FROM CHINESE MYTHOLOGY. "Crouching tiger hidden dragon" is a Chinese adage about hiding your strength from others. 7. THEY WEREN’T SPECIFIC ABOUT THE FIGHTS WHEN SELLING THE MOVIE. James Schamus, who wrote the film with Wang Hui-Ling and Tsai Kuo Jung, simply wrote, “They fight. They will be the greatest fight scenes ever written in cinema history. Period” in his first draft for the fight scenes. 8. THE CHOREOGRAPHER FROM THE MATRIX WORKED ON IT. Yuen Woo-Ping also worked with Jackie Chan and Jet Li. Lee made Woo-Ping’s job difficult in the beginning because of his preference for fighting on the ground, not on wires. 9. THEY CONSIDERED SHOOTING AN ENGLISH VERSION AND A MANDARIN VERSION. Lee ultimately realized it would be a “waste of time” to shoot two versions. 10. ONLY ONE OF THE STARS SPOKE MANDARIN. That would be Zhang Ziyi, who is from Beijing. In a career first, native Cantonese speaker Chow Yun-Fat was forced to do 28 takes because of language issues. Yeoh’s family’s language is English; she was close to tears over Lee’s demands for precise Mandarin. 11. YEOH RETURNED THE CRYING FAVOR. In shooting one of the final scenes of the film, Yeoh had to cry for five hours straight. Her tears brought tears to her director’s eyes. The crew got lost while shooting in the Gobi Desert. A sandstorm came in after their second shot of the day. Their schedule was severely delayed when it incongruously rained heavily for days. Lee said he worked for eight months straight and was “miserable,” on the verge of a stroke. 13. YEOH TORE HER ACL ON A FORWARD JUMP KICK GONE WRONG. She flew from China to Baltimore to get the MRI and diagnosis. Yeoh rehabbed in the States for three and a half weeks before returning to Beijing to shoot non-fighting scenes, then came back to America to continue progress. She came back at the end of production to finish the movie, only at 80 percent strength. 14. THE TREE SCENE WAS BURDENSOME, AND REAL(ISH). 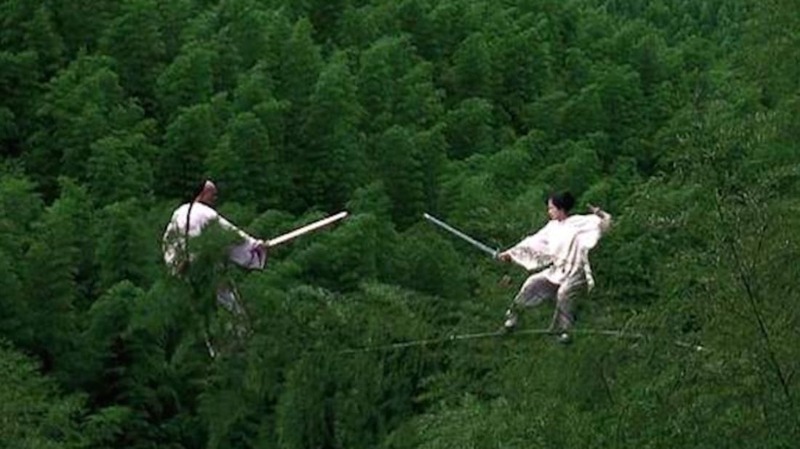 Lee had fantasized about Li Mu Bai (Yun-Fat) and Jen (Ziyi)’s fight on top of the trees, 60 feet in the air, since “boyhood.” It took 10 days for the crew to get set up at the location. The first three days of filming proved pointless. Yuen Woo-Ping didn’t even want to do it. Mostly it was the real actors, not their stunt doubles, who were on the trees and rooftops. The only CGI was removing the safety wires. 15. THERE WAS A HIDDEN THE LOVE ETERNE SHOUT-OUT. Lee is fond of the 1963 Hong Kong musical film The Love Eterne. He told The New York Times that in Crouching Tiger’s tavern fight sequence, the director referenced the way one of the actresses’ in The Love Eterne twirled her hand fan. The difference is the fan in Crouching Tiger was made of metal.